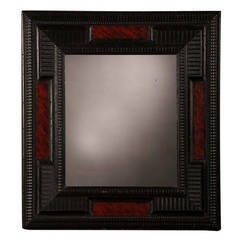 A George II style scarlet lacquer and gilded frame enclosing the original mirror glass from England c. 1860. 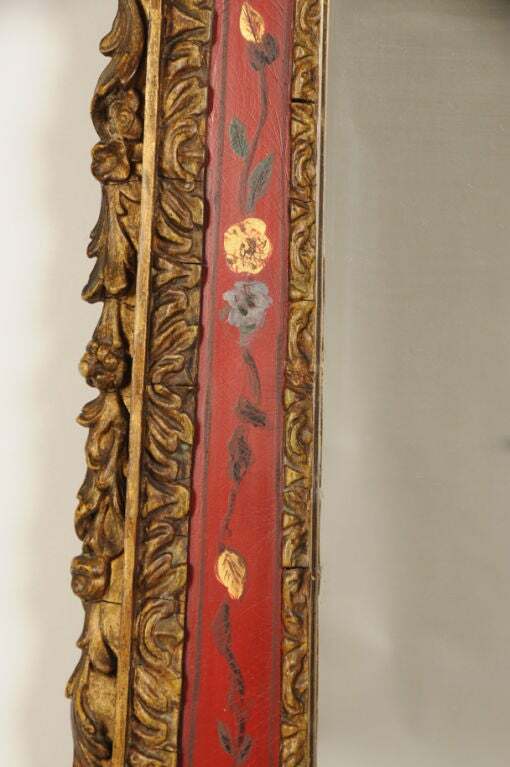 This mirror shows the profound effect that decorative objects imported from China had on English design. 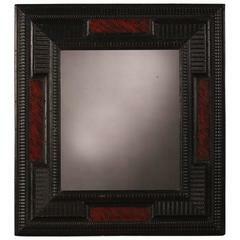 First of all please notice the distinctly architectural quality of this frame. 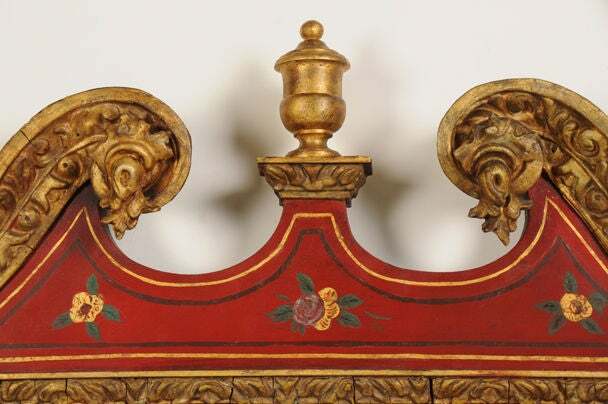 The gilded pediment top is centred on an urn standing atop a rectangular base. It is flanked on the left and right with facing scrolls that are bold and sculptural and enhanced with a pattern of foliate decoration. Beneath this the frame descends in a series of right angles before it reaches the base to terminate in a curved scallop. On each of the sides there is a further foliate adornment that is decorative but definitely contained within the architectural contour. 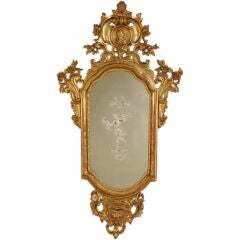 Surrounding the antique mirror glass is a carved and gilded border that is shaped at the top with straight sides and base. The pattern echoes that seen elsewhere on the frame. The beautiful rich red colour is designed to emulate Japanese lacquer ware whose purity and translucence had never before been seen until it returned on trading vessels sent to the Far East. 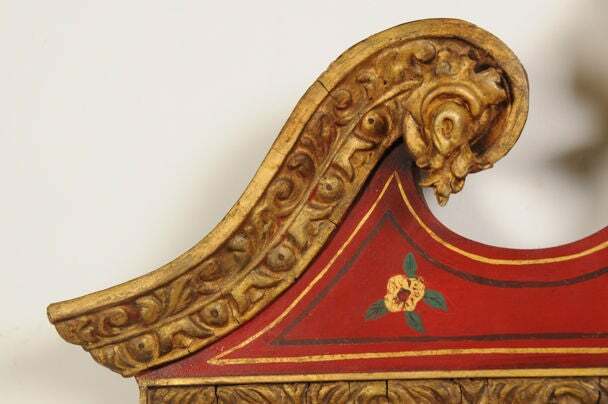 English as well as Continental artisans tried in vain to duplicate this opulent material without success so the domestic equivalent became known as "japanning". 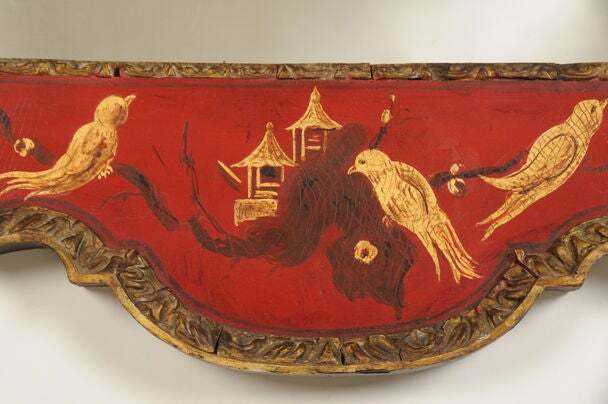 The painted motifs seen here includes birds and blossoms, temples and fruits all taken from examples seen both as lacquer ware and porcelain. 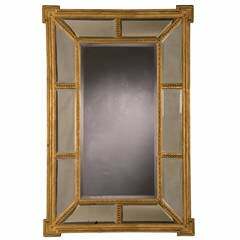 Imagine the dramatic effect where this mirror reflected the glow of firelight and candlelight in a drawing room or dining room when it first appeared. 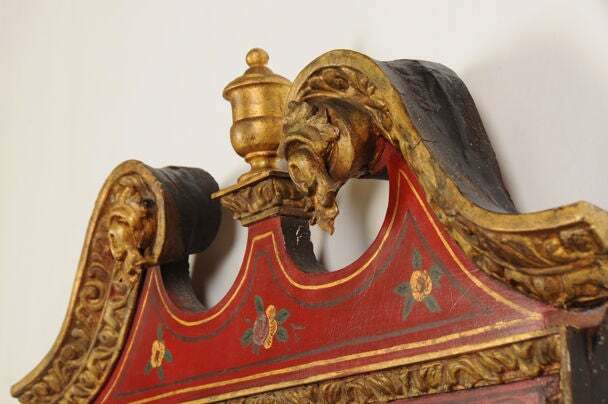 During the George II period the decoration of a room including the fireplaces, mirror and painting frames all took their shape from the architecture and were meant to be seen as an entire environment as opposed to a collection of separate objects. 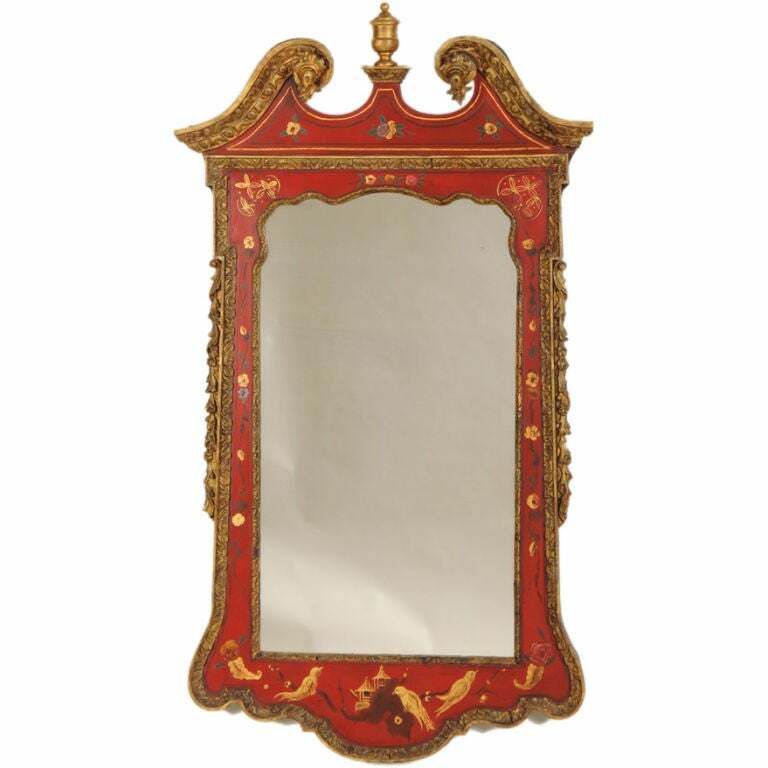 It is this combination of beautiful gilded carving and exuberant colour and decoration that give this mirror a singular quality and presence. 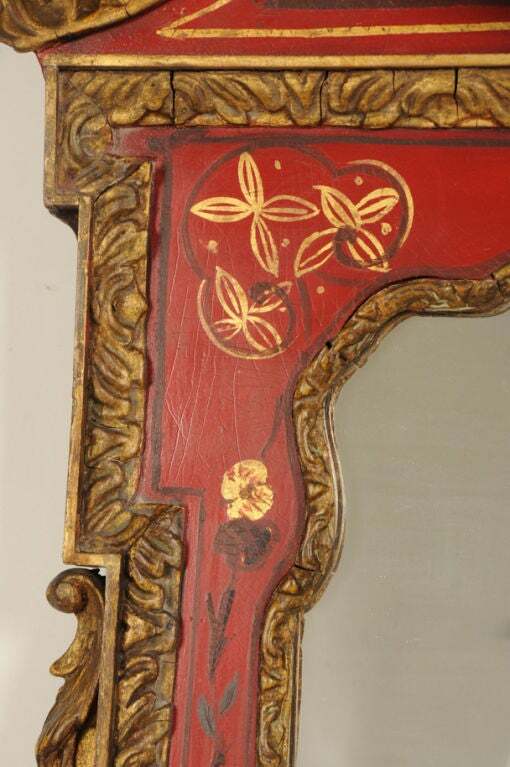 Mid-Century Modern, La Barge chinoiserie style designed mirror, circa 1980.